Three boats named Alaska were drawn by Charles S. Neff. 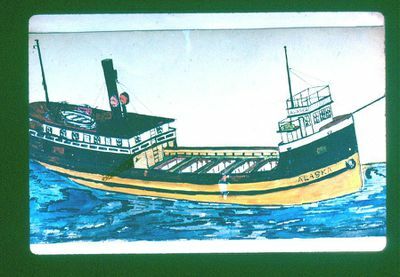 It is probable that each drawing is of the same vessel built of iron in 1871, Buffalo, N.Y.; of 1288 gross tons; 212 x 32. Anchor Line. Listed Inland Lloyds Vessel Register, 1893, 1902, and in various Ship Masters' Assoc. Directories. The vessel had a career as a passenger and freight carrier. The back of this drawing lists this vessel as having been built in 1871 of iron, Buffalo, N.Y.; 212 x 32. Owned by the Anchor Line.